A Pre-Employment Medical assessment will include a Medical History Questionnaire. This questionnaire will ask you to provide detailed information about your current and past medical history. It is important that you are completely honest when completing a Pre-Employment Medical History Questionnaire. 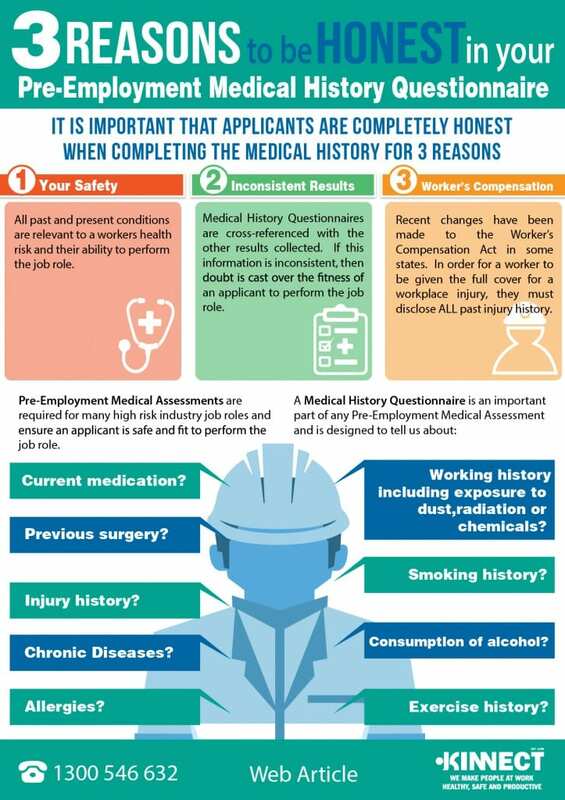 This infographic explains the 3 Important Reasons to be Honest when you are completing your Pre-Employment Medical History Questionnaire. 1. Your Safety is based on the results you provide. 2. Inconsistent Results can be caused by cross-referencing previous medical history reports. 3. Recent changes to the Worker’s Compensation Act which can affect cover based on previous injury.